A lightweight, deeply moisturising emulsion for all types of skin experiencing temporary and/or persistent dryness. 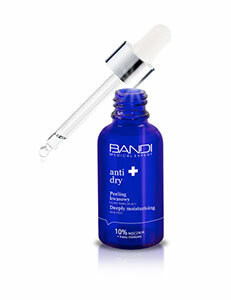 It restores, smooths and maintains the correct moisture level of the skin. Dry skin and all types of skin experiencing temporary and/or persistent dryness, regardless of age. Irritation, wrinkles and sagging resulting from low moisture levels. Apply for the day in cases of skin types requiring intensive moisturisation. In cases of normal and combination skins you may also use the formula for the night. For best results with dry to very dry skin types apply with the ANTI-DRY Nourishing and Moisturising Treatment Cream for the night. Avoid contact with eyes and mucous membranes.